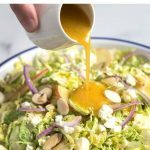 Shaved Brussels Sprouts Salad is a crunchy, flavor packed salad that’s very filling and tastes delicious with a made from scratch honey mustard dressing. It makes a pretty substantial lunch on its own, or you can serve it with some grilled chicken or fish for those with hearty appetites! I think the best way is to use a mandoline slicer – carefully! Make sure you have one that has a guard on it otherwise you risk cutting your hand. If you don’t have a mandoline you could also feed them into your food processor lid using the slicing blade. And lastly of course, you can simply use a sharp knife and slice them all by hand but this is the most labor intensive method. This is a super simple healthy salad, but in order to have it looking and tasting great here are my quick tips! As already mentioned I recommend a mandoline for easy slicing of both the Brussels sprouts and the apples. 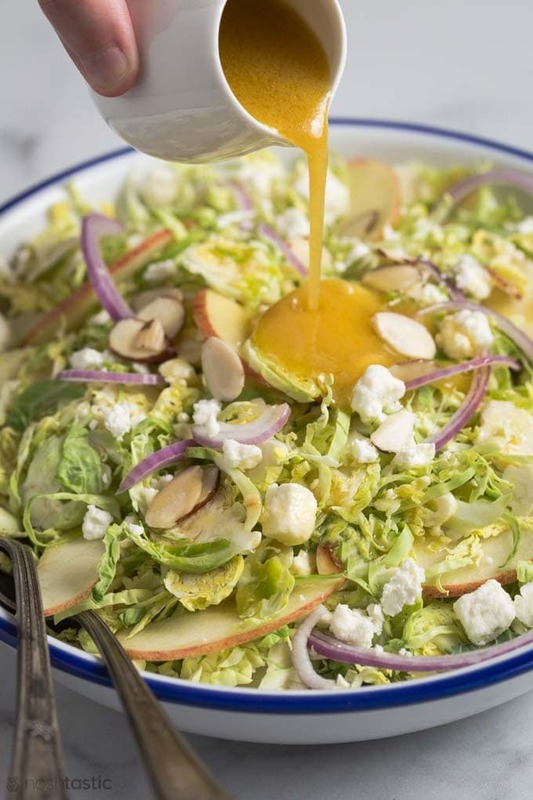 If you plan to keep the salad for later then you can add the sliced apples in mixture of one tablespoon of lemon juice per cup of water and add apple slices for around five minutes, this will prevent them from oxidizing. When you are ready to serve you can simply rinse and drain them. Dairy Free? 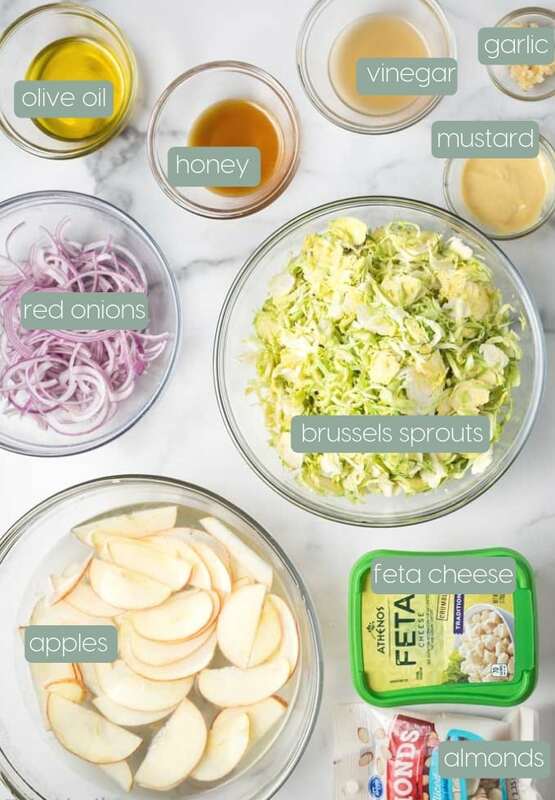 You can skip the feta cheese, it will change the flavor of course but it’s still a lovely salad without it. If you have time toast the almond slices, they taste lovely that way. 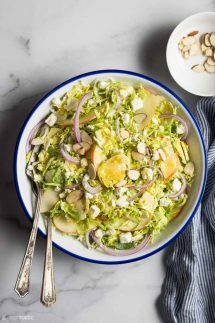 Easy, crunchy and delicious, this Shaved Brussels Sprouts Salad makes a satisfying lunch, or as an appetizer. Thinly slice the Brussels sprouts using a sharp knife, food processor, or mandoline slicer. Slice the apple and red onion, add to a large bowl with the sliced Brussels sprouts and add the salad dressing and toss well to combine. Toast the almonds in a hot skillet for two or three minutes, stirring frequently so they don't burn. Serve with toasted almonds and feta cheese.